The narration appears to be excerpts from letters to her father. From this, then, a snapshot of the film can be taken. One is that the film explores the feelings of being ‘the other’ in a foreign country, the sense of isolation that can be rather deafening at the best of times. Indeed, the theme of the company of others becomes central in the film, and not just in the foreigner’s identity sense (in fact, not so much, though readings can be made here if you want). 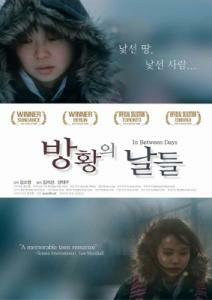 ‘In Between Days’ explores the feelings that a young girl feels in direct relation to the family, friends, and even absent figures. Aimie (Kim Ji-seon), feels for her friend Tran (Andy Kang Tae-gu). As they spend more and more time together, she finds it difficult to deal with it, and finds the blurry line between friends and lovers a difficult one to navigate. As if that is not enough, all this plays out in Canada, where she lives with her mother (Kim Bok-ja). The frustrations of living in a foreign country, and dealing with adolescent love are poured in letters written to her father, an absent figure in the film. It takes on board the most minimalist of approaches (no lights, etc), and the director Kim So Yong uses this to create the feelings with maximum impact. Without a shadow of a doubt (shadow, geddit? ), my favourite scenes were also the simplest. The static shots of the city, against the backdrop of the beautiful skyline at select hours of the day (dusk, sunset) has this effect of drawing you in. You certainly feel it even more with the longing voice of Aimie, echoing into distance of the shots. It is in these scenes that the one of the biggest ironies of the film lies, as Aimie only ever truly expresses what she feels in the way she wants it with the only person in the film who’s not onscreen. Her relationship with the absent father figure is more complete than those who are around on screen. With Tran, there is always an undercurrent of affectionate conflict. At times, you’d feel like wanting to throw the TV at her, and scream, “Dammit, tell him already!” And then you realise that without the TV, you can’t finish the film. Neither is her relationship with her mother as good as with her father’s. Her mother’s decision to move on and to meet other people hit home especially hard, and lies (little white ones or otherwise) were told. Another irony lies in the Korean-ness of the movie. I say Korean-ness, and this needs a little expanding upon. “I don’t get it,” a Tibetan friend of mine mentioned sometime ago. “A lot of the Koreans seems smart, and yet they don’t quite look beyond their borders. Most of them don’t bother learning English, mingle with other cultures, learn about other countries, even try to understand other religions beyond Christianity and Buddhism.” There are reasons for that (self-sustainability, English just not being that useful in Daegu, etc), but essentially, that inward-looking perspective is true for most of the population in Korea. Getting back to the point, the irony of the film being made in North America is not lost when we hardly ever see any other presence on screen. Steve was the only other character significant enough to be mentioned, though he was on screen for less than a minute in total, and even then, his significance was only because of the jealousy than Tran feels when he hangs around Aimie. Even within the Korean ‘perspective’ itself, divisions abound: Aimie’s dislike for Michelle, Tran’s friend, was amplified by the fact that she is a Korean-American. How “amazing”. Being able to evoke such feelings, then, is an achievement not only in directing, but also in the editing. The shots linger long enough to make you feel the sadness and the emotions. It’s the classic reaction shots, actually, but better executed here than in most movies I’ve seen. In essence, then, this movie is great. I like a lot of it, and there’s little of it that I don’t like. The director was able to put on board layers and layers of interpretation to the relationship(s). It’s almost like a James Lee movie (but without the tripod). Technique-wise, it’s similar to ‘Quiet City’. However, this movie is quite a relief coming after ‘Quiet City’. There was progression, first of all, the sense that the relationships were all leading somewhere. It’s not just talk on screen, but also the road leading to some sort of ending. Fikri wants to steal the static-voiceover scenes for his own movie.